The national meet is fast approaching, and the final release of the MileSplit50 will follow after all the dominoes have fallen. 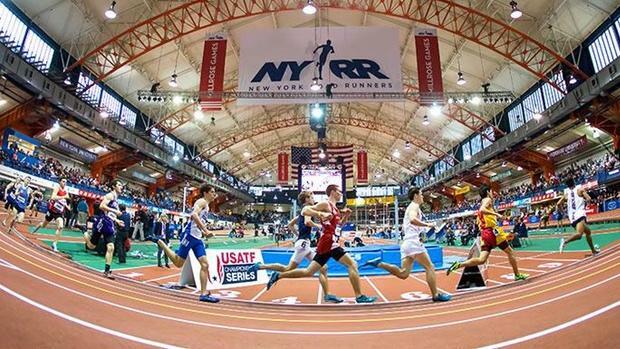 There's little debate that New Balance Nationals Indoor will offer some of the seasons' best performances, but just how will they impact the bottom line of our national rankings? A lot can happen over three days in New York, so we've dug into the storylines and came out with theoretical scenarios. Check out the top four storylines at New Balance as it relates to our final national rankings. What needs to happen for Athing Mu to lock up the MileSplit50 trophy, becoming the first athlete in four seasons not named Katelyn Tuohy to win? In our first three seasons of the MileSplit50 rankings, we've never had a race this compelling toward the end of a season. In that time, we've never had anyone close to challenging Tuohy, who's won three straight MileSplit50 titles, at a super-elite standard. But Mu has been on another level this season. What does Athing Mu need to do to keep her hold on to the No. 1 ranking? Furthermore, if the dominoes fell the right way, what would Tuohy need to accomplish in order to win her fourth straight title? Let's start with Mu first. She's been able to truly distance herself as the clear No. 1 athlete this season for a lot of reasons. She leads the country at four separate sprint and mid-distances, and has shown a remarkable versatility -- an ability to turn it on for any pace and at any distance. Furthermore, she's had one breathtaking performance in the 600m, with her 1:23.54 at the USA Track and Field Indoor Championships, which set a new American Record, a new World Lead, new World Junior and Youth Records, and a high school national record. Her 2:03.98 in the 800m and 2:44.43 in the 1K are both junior class records. And her mark in the 400m (52.55) ranks sixth all-time. Mu is on pace to shatter the all-time national record in the 800m--which stands at 2:01.78--at New Balance Nationals Indoor, and if she were to accomplish that feat, she would all but shut the door on any challenger this indoor season. Interestingly enough, Mu again has the potential to set an American indoor record (1:58.71), or a World Junior (2:01.03) mark. But let's not forget about Tuohy, who also owns four No. 1s in the 1500m, 1600m, 1-Mile and 3K. That last No. 1, in fact, is a national record from the Dr. Sander Invitational Columbia Challenge when she ran 9:01.81. But two of those top times were splits from two overall efforts. 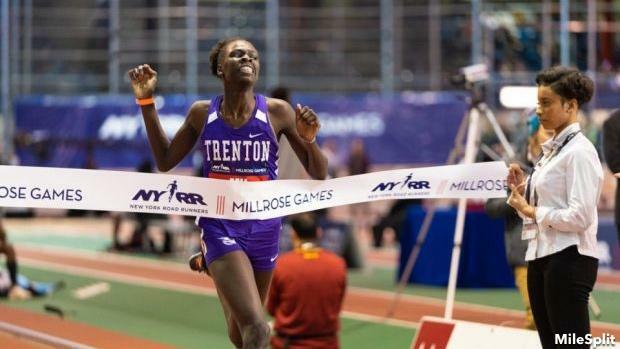 She told MileSplit New York on Saturday after the NYSPHSAA Indoor State Championships that she'll be running the 2-mile, DMR and potentially the SMR at New Balance Nationals Indoor. The North Rockland junior is going after Mary Cain's all-time mark of 9:38.68 in the 2-mile, while she'll likely run an anchor in her team's national title-aspiring DMR squad--North Rockland won the title last year with Tuohy's anchor. She would again have to set the stage on Friday in the championship DMR, hitting the kind of time that would be record-breaking on its own end in an open race. In the SMR on Saturday, she'd have to throw down a time that would somehow surprise us -- and that's hard, considering what she's been able to accomplish over the last two years -- and then come back on Sunday for a record-breaking 2-mile. In that time, Mu would somehow how have to run pedestrian in respect to Tuohy to open the door for more hard debate. Regardless, this will be the most competitive final week of the MileSplit50 we've ever witnessed. 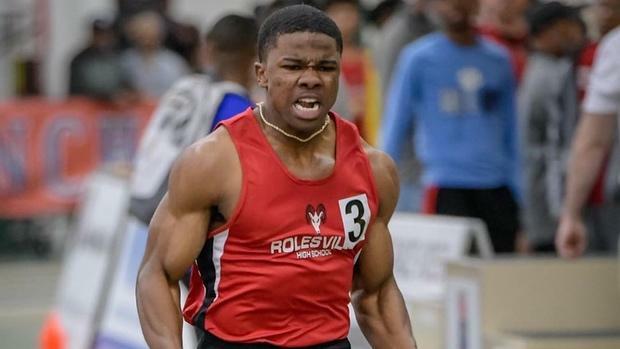 Does Ashton Allen need to win a national title, and have Bullis break two more national records, for him to take home the MileSplit50 win? Allen has sat atop the MileSplit50 rankings since week three, so the No. 1 spot is essentially his to lose. At New Balance Nationals Indoor, the Bullis School junior is entered in four events--three of them are relays. Allen will be on his teams 4x400, 4x200, mixed 4x400 and will race in the 400m. Allen is the only athlete -- other than his teammate Andre Turay -- in the MileSplit50 who has two national records and has top five national performances in his events. Perhaps the biggest obstacle standing between Allen and the MileSplit50 trophy is that individual 400m, where a loss would be damaging to his resume. While he enters with the second fastest seed time and has arguably been the most consistent runner in the event with a 47.39 and 47.36 to his name, Allen will have to take down US No. 1 Justin Robinson, who ran 46.77	in January. Although Allen's performances on his team's national-record-setting relays was impressive, he's been limited in his individual events. He does, however, rank in the top five in the nation at every distance that he has raced: 33.62 in the 300m (U.S. No. 2) , 47.70 in the 400m (U.S. No. 2), and 1:04.60 in the 500m (U.S. No. 4). The 400m will be his first open race since his 300m at the 112th NYRR Millrose Games on February 9. 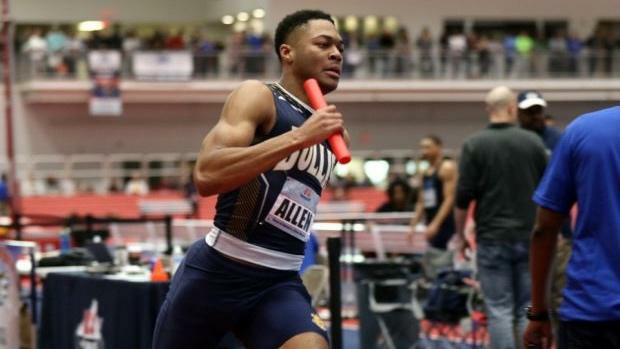 Allen's MileSplit50 trophy quest will also hinge on the success of the Bullis squads, which will be seeking to re-break their own national record times of 1:25.60 in the 4x200 and 3:12.53 in the 4x400. If all of the above goes Allen's and Bullis' way, it'll be hard to take the trophy away from him. 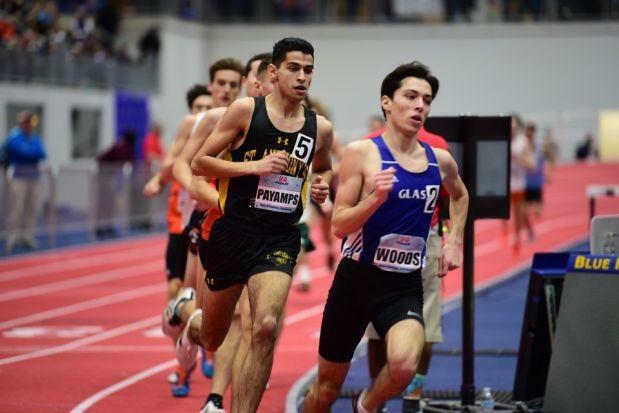 What are the chances a boy outside the top five can win the MileSplit50 trophy? We would have to see some big things happen in order to have an athlete outside the current MileSplit50 top five to win the title. But there are a handful of guys who have that kind of potential. Perhaps the one guy best positioned to make that leap to No. 1 is Matthew Payamps. The St. Anthony's (NY) senior is currently ranked 15th on the MileSplit50, but that was before his US No. 2 all-time 1K of 2:23.46 at USATF Indoor Track & Field Championships--and he's still undefeated in competition against high schoolers this year. He's currently entered in a loaded mile field where he is among a crowded list of potential winners. If he does get the win, and his time is once again historic in some way, then he's got the potential to move up in the rankings. He's also entered as the anchor leg on his schools DMR team, which is going for a national title. Another athlete who has hit an all-time mark this season and doesn't currently rank in the top five, is Trey Knight, the junior at Ridgefield High School (WA), who's entered in the shot put and weight throw. He has already put his name on the all-time list in the weight throw with his 86-7.5 throw from the Simplot Games, but he's closing in on the junior class record of 87-10.25 set by Chaminade's (CA) Conor McCullough in 2008. What needs to happen for an athlete to jump into the All-American Places (Top 5)? The boys top five currently looks like this: Ashton Allen, Marcellus Moore, Justin Robinson, Justin Forde and Kurt Powdar. We've gone over Matthew Payamps and Trey Knight, but other athletes on the cusp include Matthew Rizzo, Nick Foster, and Daniel Maton. All three are top distance athletes who could be on the inside of the top 5 on the MileSplit50 with great individual performances. We also can't forget about McCluer North (MO) High School's Lance Lang who is currently ranked ninth on the MileSplit50 with his No. 4 all-time 6.62 in the 60m dash. If he can secure a title in the 60m he could make the jump into the top five. The top five looks like this right now: Athing Mu, Katelyn Tuohy, Anna Hall, Tamari Davis and Britton Wilson. The top three athletes are locks, since all three have earned national records in their respective competitions in 2019. But curiously, Davis and Wilson are not guaranteed to stick in their position without some impeccable races. At this point, it might take two national titles to stay in the top 5. Wilson, however, has a little better handle on her spot considering her performances in the 300m (37.53) and 500m (1:10.82) rank No. 6 and No. 2 all-time on the high school charts. It's impressive that Wilson is going after a title in the 400m, because she'll face some of the stiffest competition she's seen all year in Kayla Davis. Ultimately, what it comes down to is this: The Winner of Davis vs. Wilson will get into the top 5. Both athletes own performances relative to one another, which means the final comparison will be a head-to-head matchup. However, that's without considering Davis. Tamari is in a tough position, too. Her overall times this indoor season are great, but not super-elite--her 7.27 in the 60m is No. 11 all-time and her 23.41 in the 200m is No. 12. Davis, like Wilson, might need to win a 200m title. And to be fair, she's certainly capable of doing that after flashing a stroke of brilliance last year with two national titles in the 60m and 200m. 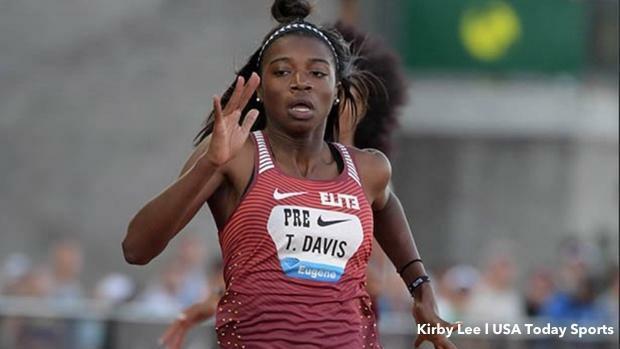 In 2018, Davis ran the seventh fastest time in the 200m with her 23.24, which was a freshman class record. She will be facing Thelma Davies (US No. 2), Kayla Davis (US No. 4) and Alexa Rossum (US No. 7). And if Davis falls, then someone like Morgan Smalls, of Panther Creek, could be there to jump up the rankings. The versatile jumper is entered in the high jump, long jump and triple jump. And if she wins two out of three, she'll make a very good case with her inclusion. Other athletes include Marlee Starliper (with an all-time mile performance) and Shadajah Ballard (entered in the 60mH, SHR and 4x200). How special would it be for Michael Gupton to run well and remain in the Top 50? Michael Gupton is the highest ranked underclassman in the MileSplit50 this year, ranked 17th. Historically, it's been much harder for underclassmen boys to achieve that feat, let alone a freshman to make the list. Last year, for instance, Knight (Class of 2020) was the highest ranked underclassmen in 15th, while last outdoor season Zachary (LA) High School's Sean Burrell (Class of 2020) was ranked sixth at one point. Gupton is entered in the 60m dash and has the potential to podium after running 6.31 earlier this year in the 55m. With a strong race, he could finish out the year as the first freshman to make the MileSplit50. Can Brianna Williams make top five with a historic performance in the 60m dash at NBNI? But it might take a high school national record for that to happen. This will be her only race of the indoor season. Considering we're talking about Williams, it's not out of the question. The double-winner at the IAAF U20 Championships showed us she can win at a super-elite level. But she hasn't run indoors since 2016, and she'll need to make quick work in her block start to be in contention for a title. Here's what Williams can bank on: There's no one in high school right now with a better block start or drive phase. The Jamaican international has World Championship aspirations on her mind in 2019, and she's got the requisite experience to compete on this stage -- easily. The high school national record is 7.19 seconds, and it was set back in 2004. The World Junior record is 7.07 seconds, and it was posted in 2014. Both times, reasonably, could go down with Williams in the picture.